Yesterday I wrote about the history of my dining room, my thoughts going into the makeover, the items that I’m using for inspiration, and some of the colors and materials. 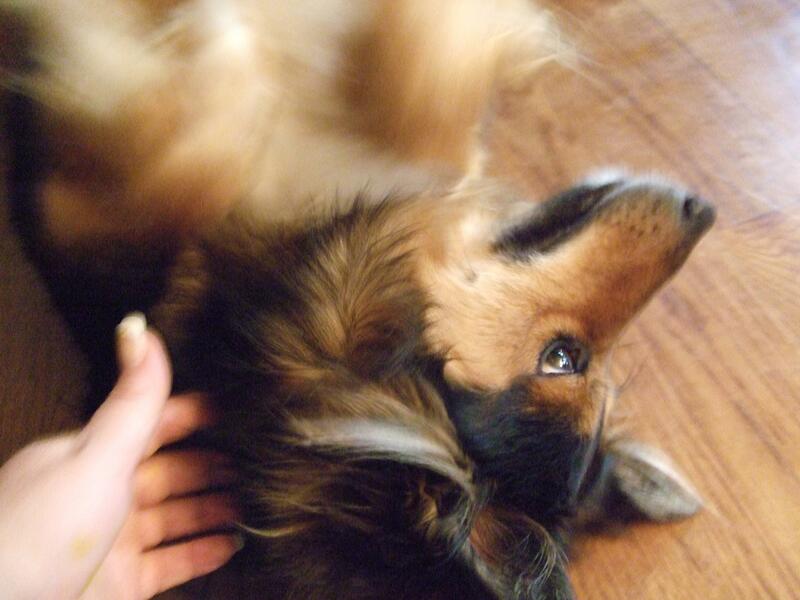 Here’s a quick update with pictures, including the recently adopted, broken tailed dog that now sports a beautiful brown, tinted gold fur coat. I’ll post in a few weeks more about decorating styles, but my dining room is not so much about a particular style, as it is the atmosphere that I want to create. As in most homes, my dining room is rarely used, in fact it probably would be more practical to use it as a library/office. But the reality is that any more, the only time my family is all together is during a holiday for a good meal. Cooking is not my favorite thing to do, but when the kids are in town and grandparents, aunts, uncles, and cousins are coming over – I really do like to cook. I like to get out my grandma’s china, put the leaves into my dining room table, and have everyone suffocate me in my kitchen. For that reason, my dining room will never be an office. And it’s for that reason that instead of going with a particular style, I’m more interested in creating a warm happy room with things that I love. 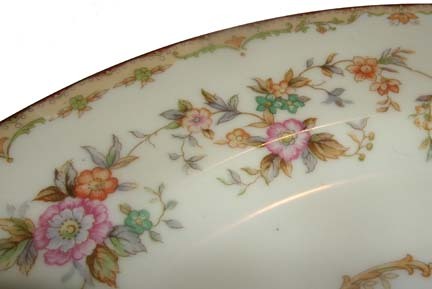 Things like my grandma’s china. 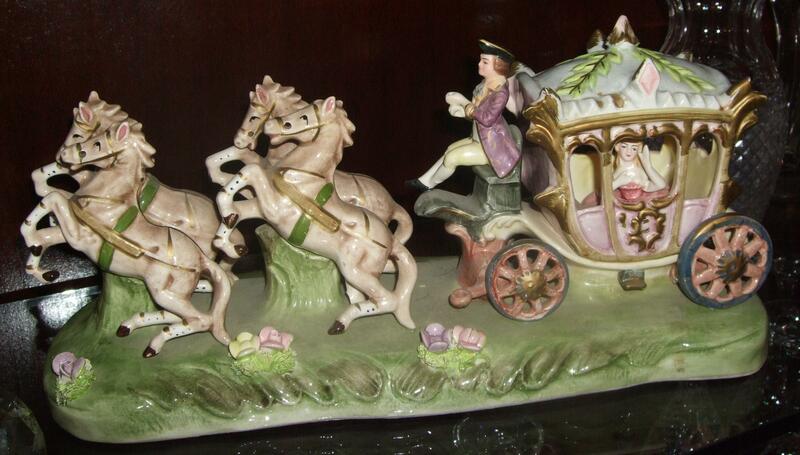 And this porcelain carriage a beloved aunt bought me years ago when scouring a vintage market. Here’s what’s new…the ceiling is painted and the lower part of the walls are as well. This picture shows a hint of both. You can also see a little of the furniture that will go into the room. 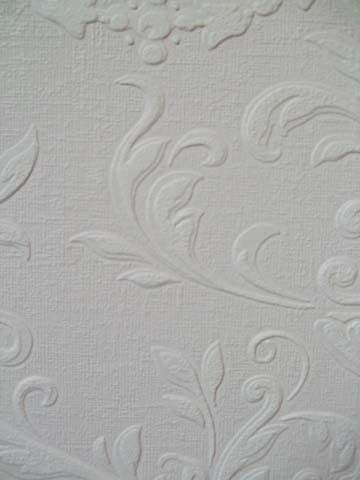 And here’s a close up of the textured painted wallcovering. Oh, and I almost forgot. Sami, our newly adopted dog who has a broken tail, could not stand to have the paint brush get more attention than her. When she tried to crawl on my lap when painting the lower part of the wall, I said in a panic -“NO!”. Of course she then rolled over, sliding down my newly painted wall which now has not only a fabulous floral raised print, but lot’s of dark fur buried hopelessly into the paint. Sami of course now has a rich golden hue to her normally brown long hair coat. Fortunately, she has paws to match as she stepped into the paint when she left the room. Lucky for her, she’s already successfully embedded herself into my heart. I’d show you a picture of the paint on her, but she won’t quit rolling over. Hopefully, next time I post, I will have found carpet, chandelier, draperies, and a picture! As you can see by this picture, we did not buy our house based on the interior decorating. 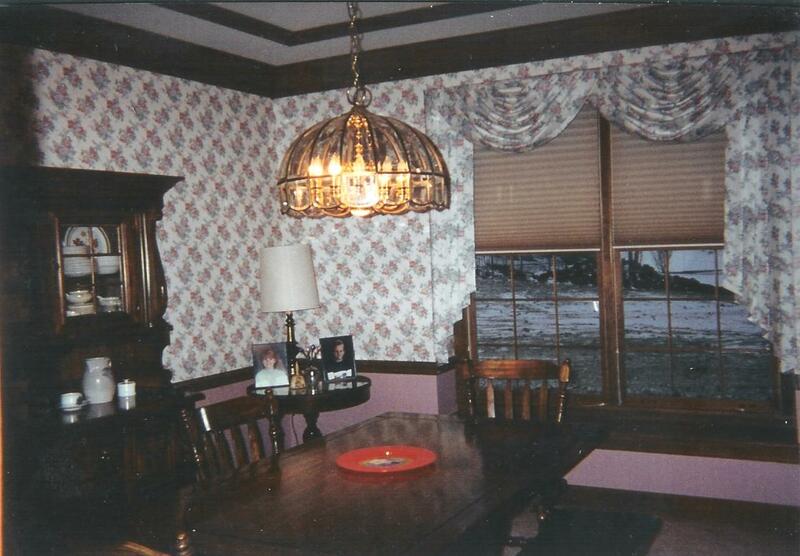 This is a picture of the dining room that I shot the first time we walked through as potential buyers. At first glance, you are probably saying “oh my!” That is much nicer than my first reaction. But my second reaction was “hmmmm, this room could be gorgeous…” The size of the room is perfect for my dining room table with all of its extensions. The ceilings are 9ft. 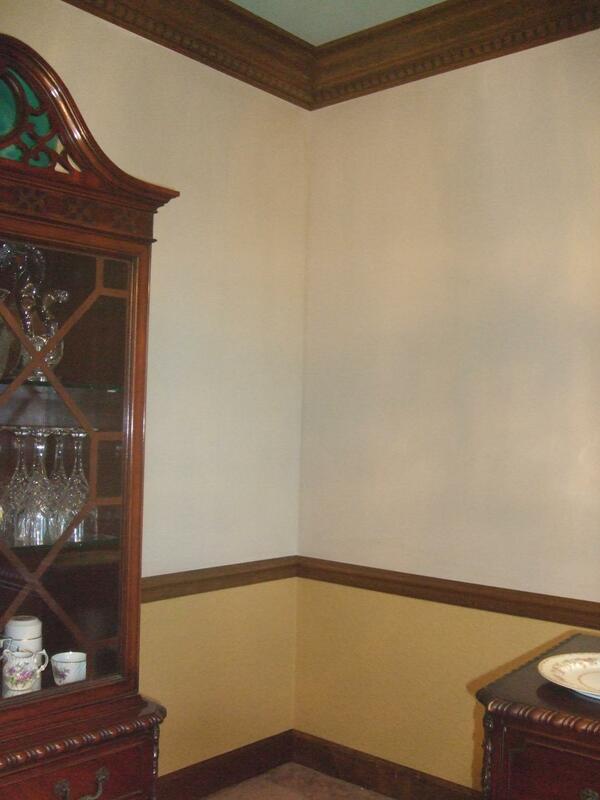 high with beautiful crown moulding and there’s a matching chair rail around the room. If you think that the interior of your home does not effect you, think again. When we moved in, I immediately took down the draperies and wall paper; promptly improving my mental state. At least now I had a blank canvas. See for yourself. If you see a pink glow, it’s from the carpet, which I should add – is most DEFINATELY being replaced. I have lived with this for quite a while, mostly because I have been just too busy with work, but with Ashely’s graduation in less than two weeks, I have been shamed into action. I will admit to you that I don’t have a final vision yet for this room, mostly because I need to find ready made 95″ draperies and that will determine my direction. 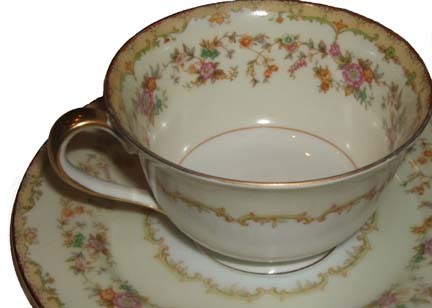 I do have a set of my grandmother’s china that I love. They will be part of my inspiration. I’m also working with my other grandmother’s antique dining room set, which is not my first choice but for now, it will do. I’ll take a picture of them for you tonight. Here is what I know about my room so far. I want a blue ceiliing. A friend of mine who is a designer in Georgia uses blue celings as her trademark and those ceilings are so happy. I want a happy ceiling. My blue will be a tiffany blue. Note that the blue is not a color that I will bring in anywhere else, it’s going to be there to really set the mood of the room. You won’t really notice it at first, until you look up – and then it will be a lovely suprise. 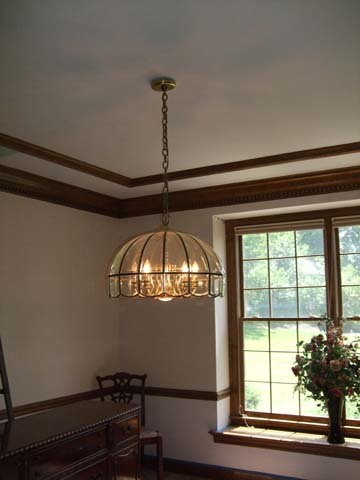 I also am going to add a medallion, but the finish that I put on it will be dermined by the chandelier that I buy. Stay tuned for that one. The chandelier really screams the 70’s, and I am not so in love with the style (or the fashions) of the 70’s. It’s definately going to be replaced. The color for the walls will be Behr’s Gold Buff – I’ll show you that in part II. It’s a common color that will eventually be used throughout my main level. I like it because it’s warm and really acts as a neutral color. The color of the room constantly changes depending on the time of day and light. My previous home had this color throughout and you’d be suprised how many people didn’t really notice the color, as much as how it made them feel. It’s warm and welcoming – it makes it home for us. I did want to add some texture to the walls, so I hung a scrolling textured/paintable wallcovering below the chair rail and will paint that gold buff as well. 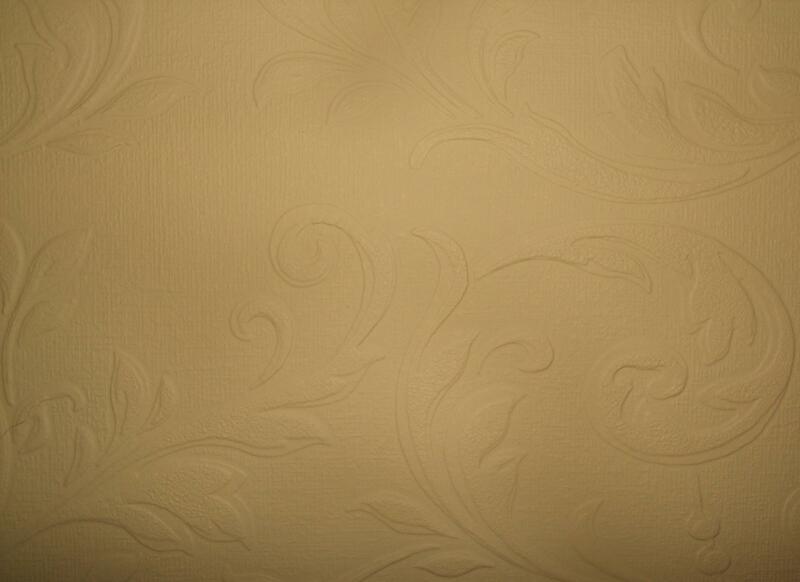 Here is the unpainted textured paper up close. It’s pretty inexpensive and it just adds a nice dimension to the room. 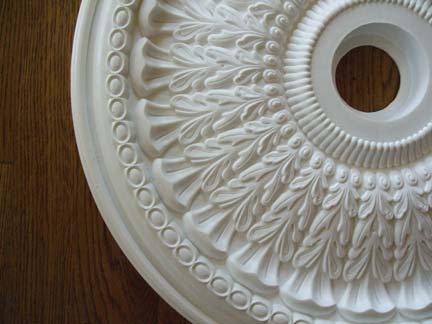 It hangs just like wallpaper, but can be a little tricky to trim. I was a little irritated with it, but then again, I wasn’t being a patient laborer. haha! In the end, I would do it again. That’s it for now, but I’ll have some more updates tonight or tomorrow, so check back in. The pressure is on!